WAS THE SUBJECT OF PRIESTS"
Q. Do you often think about the apparitions? A. Yes, enough. Sometimes I think it happened to somebody else. Q. Can you still remember what the Blessed Virgin looked like? A. Yes. She was someone you never forget. Q. 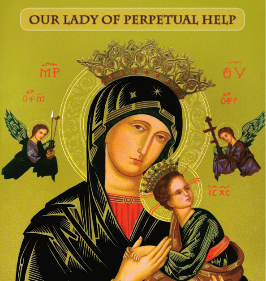 Here is a picture of Our Lady of Perpetual Help do you remember when visiting the New York Center in 1976 and seeing this picture on the kitchen wall of Joey Lomangino's home, you said that the look in the eyes reminded you of the Virgin? A. I remember it well because the eyes in this picture have a very compassionate look which remind me of the Blessed Virgin's look, but the face of this Virgin is a little fuller than the way I saw her. Q. Can you describe the crown that Our Lady wore? Did you ever count the number of stars? A. It was round and of 12 stars. Q. Twelve? You counted 12 stars? A. Yes, and whenever I see a statue of the Blessed Virgin with the crown, I always count the stars to see if there are the right number. Q. This is a fine detail that I don't know if you will recall but were they six pointed stars or five pointed stars? A. I believe they were five, yes, five. Q. Was the crown open? *During the apparitions, the Blessed Virgin handed the seers her crown so they could look at it more closely. Q. Did the crown go straight up (in a vertical position)? A. It was tilted slightly toward the front. Q. Wasn't there a pattern on Our Lady's dress? Can you describe what it was? A. There was a design of flowers but they were faint. Q. 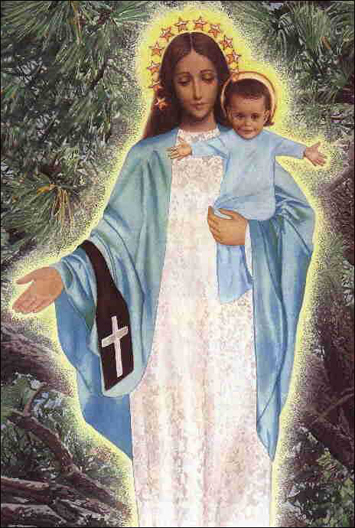 The Virgin came to Garabandal as Our Lady of Mount Carmel and had the scapular on her wrist during the apparitions. Did you know what it was when you first saw it? A. Yes, we recognized it because it looked like a scapular and we were already familiar with it because we had always worn it in our families. Q. Did the Virgin actually speak to you about it? Did she explain its significance? A. Yes, she spoke about it. She said it was very important. Q. Can you describe the scapular the Virgin had on her wrist? A. It had a mountain on one part and a cross on the other. Q. Do you remember what colors the cross and mountain were? A. The scapular was dark brown and the cross was white. The mountain was a different color maybe something like cream. Q. On the two nights of screams,* you saw visions of the future conditional chastisement that would come to mankind if we do not change after the Warning and Miracle. Did you also see the Warning? *On the nights of June 19 and 20, 1962, the visionaries were heard screaming in terror when they saw visions of the future conditional chastisement and other events to come. A. I prefer not to speak about that subject. The Blessed Virgin didn't say we should speak about all the details of what was shown to us. I remember she said it was very important that we pray about all that. Q. My question is whether you actually saw the Warning. I am not asking you to reveal things that you are not supposed to speak about but rather if you just actually saw it. A. I can't explain it very well. I remember that I was very afraid. It seemed as though it were both [seeing it and being told about it]. Also, everything got very dark. You can imagine how terrifying it was because we were still very much afraid even though we were seeing the Virgin at the same time. Q. Did you see visions of the communist tribulation that is to precede the Warning? A. I don't know exactly. The Virgin said that we should pray much so that these things don't come. Q. Could you tell the difference between visions of the chastisement and visions of the Warning or tribulation? A. Yes, we could tell the difference because the chastisement was a far more fearful thing. Q. In a 1979 interview, * you said in describing the communist tribulation that "it was like an invasion. " Did you see scenes of this invasion? Q. Did you ever see anything that had to do with the Holy Father? A. No, but the Virgin said that in the future he was going to be in need of much prayer. Q. You have also said that when things were at their very worst then the Warning would happen. How do you know this? Did the Virgin tell you or did you see it in a vision? A. The Virgin said that the Warning would come when conditions were at their worst. It wouldn't be just the persecution either because many people will no longer be practicing their religion. (Below) Today, Jacinta still reflects the same purity and innocence that was so apparent during the time of the apparitions. Q. Were there things that you saw on the two nights of screams that the Virgin told you not to talk about? A. Yes, there were things and no, we can't talk about them. Even if I wanted to talk about it, I don't think I would be able to explain it properly. Q. Many people believe that we are living in the age of the apocalypse. Did the Virgin ever speak to you about the end times or indicate that we were living in the "latter times"? A. I don't remember her saying the "latter times" but I do remember her saying "difficult times." Q. Did the Virgin ever use the word apocalypse? A. I don't remember now but it's possible that she did. Q. Did the Virgin ever give you any secrets that you can't reveal? Q. Is there anything you can say that no one has ever asked you? Q. Did the Blessed Virgin ever speak about St. Joseph? A. I don't remember if she did. Q. Do you remember when the Virgin told you that the Churches would unite? A. I don't remember when but she did say that the Churches would unite. Q. Did she say if it would be the Catholics and the Protestants or did it include, for example, the Orthodox Church as well? A. All would reunite into the Catholic Church. Q. All would come into the Catholic Church? A. She didn't name the other Churches but said that all would come into the Catholic Church. The way she said it was all humanity would be within one Church, the Catholic Church. She also said it was very important to pray for this intention. Q. Did she indicate when this would take place? A. No, but the more we pray the faster it will happen. Q. Sometimes you had apparitions alone with the Blessed Virgin. Do you remember some of the things you would talk about? A. I remember her talking to me the way a mother would talk to her daughter about everything. Q. Did she prefer to discuss certain subjects as opposed to others? A. The subject the Blessed Virgin seemed to prefer the most was the subject of priests. Q. In the first Message, the Virgin asks for penance and sacrifice. What does that mean to you? A. For me the word sacrifice means accepting the difficult things, the things one does not like. Q. Did the Blessed Mother ever indicate to you what would be a sacrifice or a penance? A. She never specifically indicated. She did say how we should act; to be simple, honest and obedient. Q. Did Our Lady ever give you any personal guidelines for your life such as certain prayers you should say every day? A. The first prayer the Virgin recommended was the holy rosary and then the "Confiteor" before receiving holy Communion and the prayer "Soul of Christ" afterwards. Q. Did the Blessed Virgin ever speak to you about the Sacrament of Reconciliation ? A. Yes, she did. Now there are people who want to do away with it but the Virgin said it was very important. Q. Did she say how often one should go? A. As far as I remember, she didn't indicate how often one should go but said that it was important that one recognize within one's self that they had sinned in order to make an effort not to do so and to improve one's self. Today there are many people who give no importance to sin. Q. Did the Virgin ever speak about purgatory? Q. Did she actually use the word purgatory? A. Yes, because she said many souls go there. Q. 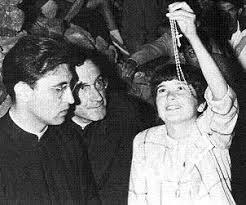 During the apparitions, the Blessed Virgin taught you to recite the rosary very slowly. Do you think she did this only because you were children who should learn to say it properly or do you think it was meant as an example that everyone should follow? A. It was meant as an example for everyone. Q. When you recited the Hail Mary in ecstasy, bystanders heard you say, ". . . holy Mary, Mother of God and our Mother. . . " Did the Blessed Virgin ever say anything to you about adding that phrase or innovation? A. She said she liked it very much but that we shouldn't use it until the Church approved of it. Q. How did you come to use it? Did you decide among yourselves beforehand that you would say it that way or did it just come out spontaneously while you were praying in ecstasy? A. It just suddenly came out. As we were praying we just felt it inside of us. We wanted to tell her that she was our mother too. Q. Did all four of you say it at the same time? A. I don't exactly remember but it seems as though it just came out. Q. Do you remember while praying the Creed in ecstasy adding the words "apostolic and Roman"? A. Of course, this is the way the Creed is supposed to be said. Q. Of all the teachings you received from Our Lady, which one has made the greatest impression on you? A. For me, it was obedience. Once when the Virgin was to appear to me at about three in the morning, my father wanted me to go to bed so I complained to him. Then the Virgin didn't appear to me for a month and when she finally did, she explained to me the reason she hadn't come was because I had not been obedient to my father. Q. Did you ever think of becoming a nun? A. Yes, many times after the Blessed Virgin appeared I thought of becoming a nun. Before the apparitions, no. Q. Many people have the idea that those to whom the Blessed Mother appears should become religious whereas all the Garabandal visionaries have married. What would you say to those who think you should have become sisters or nuns? A. I used to think the same way myself. But what I would say to those people is that a person must follow their vocation. Later, I realized that it was not my vocation to become a nun and had I become one I think it would have been like a condemnation because I wouldn't have been able to live up to what I was supposed too do. Q. Did the Virgin ever indicate to you in any way that you would eventually marry? A. No. When I asked the Blessed Virgin if I would one day become a nun she would not answer me. Q. 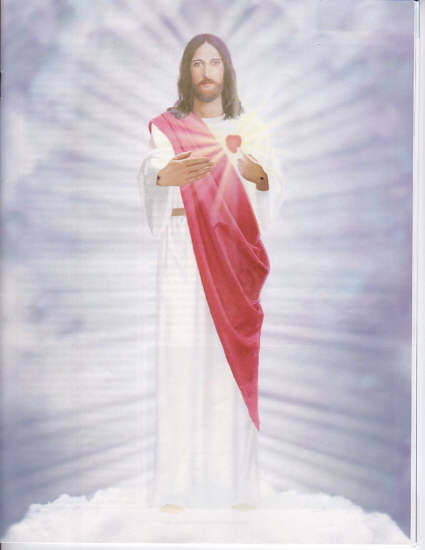 You were the only one of the seers to see a vision of the Sacred Heart at Garabandal. When you reflect on that vision what comes to your mind first? A. I remember it better than the visions of the Blessed Virgin. He [Our Lord] had a look of love on His face and although He didn't say anything, I felt He was saying, "I am with you and I will always be with you." This vision was different from the ones of the Virgin. Q. When you think back about the visions of the Virgin and St. Michael what thought first comes to your mind? A. My first thought is, why me? Why was I chosen? Q. When was the last time you went to Garabandal? Q. Did you happen to see Man Cruz and did you talk to her? Q. Did you speak to her about the apparitions? A. I prefer not to comment on what we spoke about. Q. Can you think of any reason why she has not retracted her denials like the rest of the visionaries? A. I think she is a good person but I have no opinion as to why she has not retracted. Her parents have not supported her too much in this affair. Q. How many brothers and sisters do you have and what are they now doing? A. I have seven brothers and sisters. All are older than me except one. They are all now working in Spain except one who is in New York. Q. How are you related to Conchita? *Jacinta's grandmother and Conchita's grandmother were sisters. Q. How do you like living here in California? A. I would prefer to live in Spain. Q. Do you think you will ever go back to Garabandal again? A. I would like to. I hope that someday I will be able to live there again. Q. 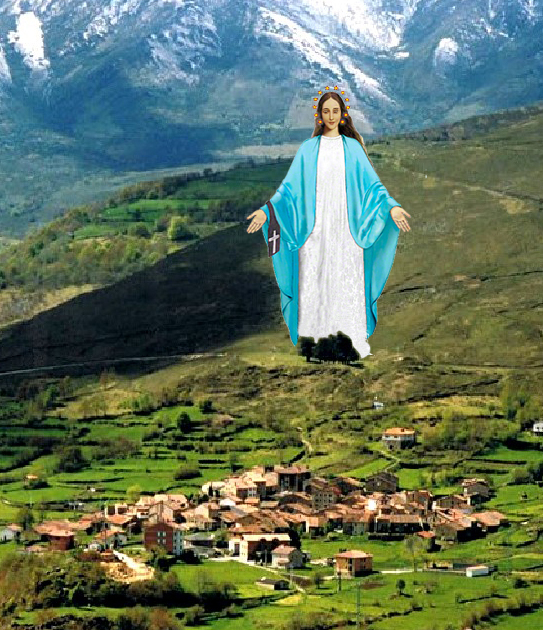 What do you think of the village compared to what it was during the time of the apparitions? A. I liked it better the way it was before because it was simpler and the people were more spiritual. But I still like it. Q. Do you keep in touch with the other visionaries? A. Yes, by telephone (laughter). Jeff interjects: "You should see our phone bill." long as two hours (more laughter). And I'm the one making the call [sometimes Loli or Conchita call Jacinta]. I call when I'm feeling a bit sad or depressed. Q. When you look back at the time Our Lady gave you the first Message and the concern she expressed at the time, do you think she is pleased with the way the Message is spreading? A. I think she is happy with the way the Message is spreading but at the same time I think she wishes that it continue to be spread even more. The Message is the most important thing. Q. Is there any advice that you would give to those who are spreading the Message? What particular virtues do you think the Virgin would like to see in those actively involved in the apostolate? A. It's important that those who are spreading the Message set the example by living the Message themselves. Q. If you could give a message for the world what would it be? A. People should have mutual respect for each other as human beings and above all they should place God first before their fellow man.